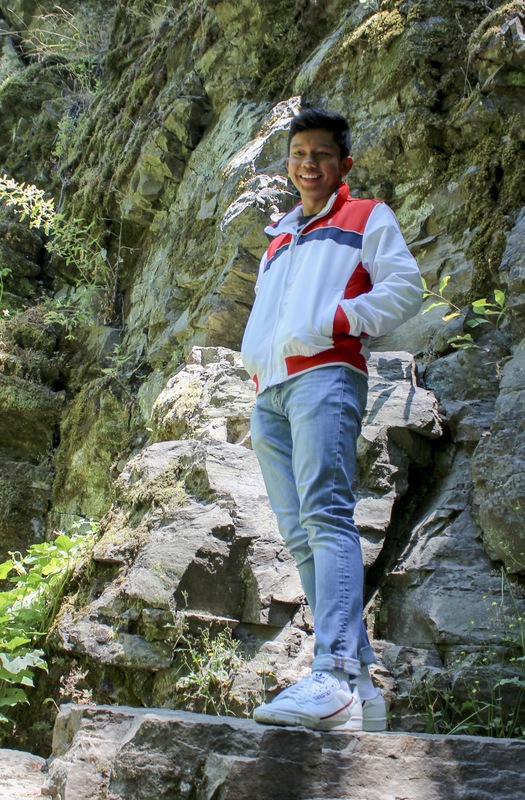 Matthew Magno: New Spring 2019 Aggie Research Scholar! Interests: Eating, tennis, photography, scrolling through Reddit, going on spontaneous trips to try new things, and terribly but shamelessly singing karaoke (my inner Filipino). One Amazing Thing I’ve Seen or Done: I once ate $100+ worth of carnival food in the span of two hours. And that’s something I’m proud of. My name is Matthew Magno and I’m a freshman Chemical Engineering major at Texas A&M from Pearland, TX, a suburb just south of Houston. Though my college undertakings may not have been as superlative as others fulfilling a research role, given my short time here, I have been able to savor every opportunity just as much that came my way prior. After finding the power- and with it the potential- of my energy and the sound of my own voice starting out high school, I happily officiated STEM and culture-related clubs, dedicated hours upon hours volunteering for organizations like Space Center Houston and The Houston Food Bank, and with it met plenty of new people, allowing me to expand my understanding of the world, the people, and its functions therein without having to travel such far distances. Today, when I am not studying or attempting to write down every possible detail from my professors’ lectures, I enjoy playing tennis and League of Legends, going to church, watching Saturday Night Live, and spontaneously traveling far distances with friends just to eat. In my senior year of high school, I decided to embark in the field of research by joining a class called AP Capstone Research, where students had two semesters to develop research projects of their own. I picked something that leaned toward my interests- chemistry, environmentalism, and humanity- and chose to base my research paper off of water sustainability, entitled “The Efficacy of Underground Atmospheric Water Condensers to Improve Water Self-Sufficiency in the Slums of Lima, Peru.”(It is a pretty long name, but do not let it scare you) Due to corrupt government actions and miscommunication, impoverished citizens in Lima, Peru have begun relying on expensive water vendors thus spiraling families into a deeper pit of poverty. To find a solution, quantitative and systematic review research was approached in determining the efficacy of the underground atmospheric water condenser, an alternative to fog net harvesters that similarly reduces dependence on the monopolized water. Even though I struggled to learn new concepts to complete the paper, including psychrometrics and soil variability, I have unapologetically been able to unearth my passion for research at a fairly young age. 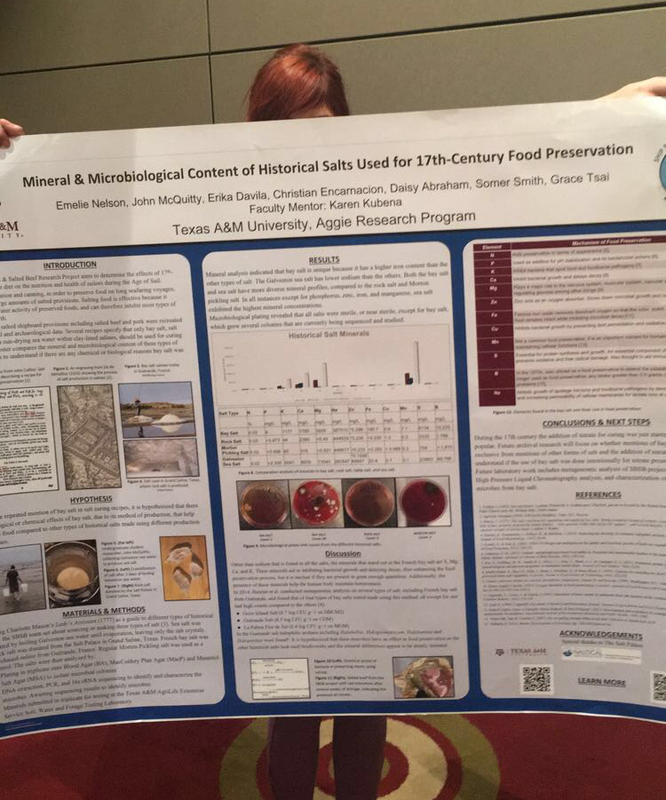 After hearing about the Aggie Research Scholar program through my email on the day of the research week fair, I decided to see what the rest of the event had in store. Unbeknownst to me, this one quick decision would allow me to further delve into my passion for research. I walked into one of the ballrooms where the research fair was being held and found the Ship Biscuit & Salted Beef research project. I talked to Erika, one of the students involved in the project, and after a lengthy conversation, was interested in helping out in any way, shape, or form. From then on I inquired about joining the Ship Biscuit and Salted Beef research and was given a tour of the lab and the opportunity to join the following semester. Why research? As a freshman? And more specifically, why this one? I chose to partake in the Ship Biscuit & Salted Beef research simply to enhance my understanding of undergraduate research and fuel my desire for understanding the fundamentals of human lifestyle in not just the present but the past as well. I.e., beauty in the unknown. Since the beginning of my first semester of college, I have always been eager to be more than just the mediocre college student, proving to myself that there is so much more to life than what social norm dictates one’s age can actually accomplish and experience in both the academic and social realm- to be able to set up the seemingly hardest challenges for myself and accomplish them just goes to reassure me that I am only bounded by what I make of myself. (to put it in simpler terms: I like doing stuff :-D ) Research gives me the ability to do just that: to make connections upon real-life problems, gain insight, and meet plenty of other people. Though I do not plan to handle 17th century food for a living- thankfully- I ultimately hope that being a part of the Ship Biscuit & Salted Beef research project gives me a glimpse of actual, non-class related lab activities and teaches me how to work efficiently with very much determined people so that I am prepared for what can come in store for me later on in life as a chemical engineer. But all feelings of seriousness aside, I cannot wait to be involved with research and the new experiences it may have to offer me! Gig ‘Em!